Home/ATP Masters 500/Halle Draw 2017: Can Federer Bounce Back From Stuttgart Loss? Halle Draw 2017: Can Federer Bounce Back From Stuttgart Loss? First up is Lu Yen-hsun from Chinese Taipei, Roger played him at Wimbledon many moons ago and on his day he's a pretty decent player. Looking at his activity he was supposed to play in Rosmalen but withdrew before his match again Evgeny Donskoy so I'm not sure if he was carrying a knock. As a result, this will be his first match on the grass of the season, but it is his favourite surface having beaten Roddick on it at SW19 in 2010. As we saw in Stuttgart anything can happen but he's typically not much of a threat to Roger who will be able to play the match on his terms. For the quarter-finals, there are quite a few players who can come through. Both Paire and Pouille (who play each other today in Stuttgart) are in this section. Paire supposedly hates the surface and Pouille has a Wimbledon quarter-final on his CV from last year so he's the favourite. Struff and Florian Mayer are the other two guys in this section with home soil advantage and Mayer is, of course, the defending champion who you can never rule out. Kei Nishikori is the seeded opponent for the semi final and he's not played since his loss to Murray in Paris. If he's injury free then he's in with a shot of getting that far but Verdasco in his opener won't be easy. Karlovic will likely factor too in his section. The finals then have Thiem and Zverev as the two top seeds in that half. Thiem has proved he can play on grass but it's by no means his best surface so I don't think he's nailed on to come through. Zverev showed form on grass last year pre Wimbledon and he's playing well in Rosmalen so I'd make him the favourite. Kohli, Gasquet, Monfils and Tomic all reside in this section too and all of them on a given day can make finals or win titles at this level. So expectations for Federer? I think he has to make the final really after losing early in Stuttgart. Looking at the draw though the tournament is completely wide open. There are plenty of guys who have pedigree on grass and I can see some seeds falling early. Over best of 3, it's tough to predict but I think Fed will fare ok. The first task is to see off Lu in straights. Yeah I agree he needs to reach into the latter stages of the tournament really. Draw seems winnable enough if he’s to be much of a factor on grass this year but after losing early who knows really. Hopefully he gets a few wins. Draw harder than Stuttgart on paper though I think. Lu comparable to PHH and Haas on his day. Should be on his racquet. Not sure what to make of his loss to Tommy after he was so dominant in the 1st set – saw somebody suggest he had taken his foot off the gas, partly because he WAS so dominant, and partly because of the friendship…. not convinced, especially since he did have that mp in set 2, but perhaps it was a factor along with the lack of match practice, and of course Tommy raising his own level. Hopefully that will have been an incentive to get his head more solidly where it needs to be. His long history at Halle should help him out too. Guess we’ll see. Overall a decent draw I think. Maybe he should wear a wig to appease fans. For some reason, I don’t have a lot of expectations for the grass season. I’ve got my eye down the road to the US swing and longer hair. Hope I’m wrong. Please. You sound like a cowboy. I think you are right. Hard court is more this thing because the bounces are the most assured. I hope he can go deep, it will be a nice turnaround after dismal outing at Stuttgart. First 2 matches should set him up nicely for quarters onwards. I hope his hair grows quickly. Zverev coukd be tricky if he maintains form from Stuttgart, he was on top vs. Lopez. nice to see he hasn’t lost his sense of humour! Was that in press after loss? Not seen it. Whole family usually make the trip to Halle, prob got a decent place to say in the area. I thought Roger usually stayed in a hotel virtually on-site there, no family around? Or am I confusing with somewhere else? 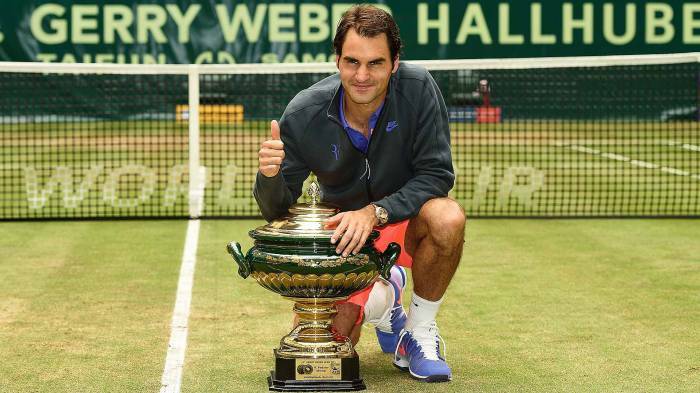 Federer should win his 9th Halle title (I have a good feeling about this). Yes one match at a time. I expect to roll over after the first two outings. I’ll be positive about his chances (unlike most of the times). Roger will be fine. Compared to the Aegon Queens Championships, this is a far easier draw. No Murray, Wawrinka, Raonic, Kyrgios, Berdych, Dimitrov or Tsonga to worry about. Roger better win this. I think he can. All he needs is a couple of wins to get him going. Sure, it will be an interesting match if he faces Zverev/ Thiem and maybe Nishikori in the semifinals s but overall this is an extremely winnable draw – assuming that Roger is Roger. Compared to the Aegon Queens Championships, this is a far easier and extremely winnable draw. No Murray, Wawrinka, Raonic, Berdych, Tsonga, Dimitrov, Kyrgios or Raonic to worry about. Sure, it could get interesting if Roger gets to play Zverev/ Thiem in the final and potentially Nishikori in the semi-final but overall I expect him to win the tournament if he is in fact ROGER FEDERER. Maybe his unluck in Stuttgart was a luck in disguise. Maybe the great expectations from AO and gold-swing and hype is felt too heavy at the moment, so ok to be a little downward to get upwards from? We’ll see. I was nervous in AO, I’m nervous now. Maybe good? Ironically since u wrote this, Pouille beats Paire, Muller beats Sascha, and Ivo beats Cilic! Grass! Such fine margins! Rog will easily take care of Lu. Mischa clearly will be weary post Stuttgart where he Shld hv beaten Feli!! I also wonder if we might get a few withdrawals from Halle..
Rog saw Stuttgart as a warm up.. his demeanour on court was not as business like as it Shld hv been. Halle? He means to win. I also think his intentions are longer term.. North American hard court runs etc! Yes, vv serious abt Wimby but USO a goal too. After the stellar start to the year, anything else is gravy. I have no feelings about Wimby but a strangely good vibe about USO. I think Fed is better prepared on HC this year. So yes, USO and WTF looks promising. I have no idea how to set expectations for Wimbledon. One match at a time starting with Halle. I thought the draw is quite kind to him. I don’t think he’ll be careless again. Last chance to get s few matches under his belt before Wimby. He’ll do well. Guys do you have any info when will his first match take place? I wanna buy tickets but I can’t find any info ! I feel Roger will win this tournament without dropping a set. Stuttgart was an aberration. Having a match point and losing is the best prep he would have wanted for wimbledon. Inspite of the Stuttgart shocker i have a feeling Roger will win Halle but will fall in wimbledon semis to Andy Murray. ( from Rogers biggest fan). Lu’s a good grass courter but he’s not the player he once was (when he gave Fed a good match at Wimbledon in ’09. Would be nice to see another Fed/Mischa match – good practice for his returns and passing shots. Pouille, Nishikori, and Thiem/Zverev is about as tough a QF-SF-F he’s had at Halle before, so he’ll have to be on his game to win the title assuming those are the three opponents he plays. Hey all, here is my prediction: Roger to not struggle till SF or Final. Kei Nishikori to struggle for EVERY point, game, set and match and then in the SF against Roger…. to be possessed by all the Tennisgods and to give Roger a hell of a time 🙂 Mark my words people…. Kei will struggle big time, just enough to meet Roger and be his unplayable self again 🙂 Seen that movie too many times right?? Lu withdraws. Sugita in as a lucky loser. Update June 20, 1 pm CEST: Roger Federer will play Japanese lucky loser Yuichi Sugita in the first round after Yen-Hsun Lu withdrew Tuesday with a right-arm injury. Now, if Roger loses again we can definitely say that there is a conspiracy against him. He’d better win. I’m watching from behind the sofa. Haha! A few loose tennis balls came over. Pfft. Hahaha. Last two games were a joke. Maybe someone shouted: “Hey, switch off tennis. This is marbles now.” And they went for it. Two wins in Halle for Federer will guarantee him a top-four seeding, avoiding potential Wimbledon quarter-final vs Murray/Djokovic/Nadal. Didn’t know that Roger can be Number 5 in the world but get a top 4 seeding at Wimbledon. Let’s hope he wins the next match. In fact, why not go all the way? Finally got his Number 1100 WIN. It’s because Wimbledon seeding system is different. I like it better when Roger is the 17th seed. Fed’s doing better this year with higher a seed. Hope he can get back to 17th before Wimbledon. Poor Stan. Tough coming straight off clay and then having to play Feli Lopez on grass. But what the HECK was Andy doing losing to Jordan Thompson?! Wow! Murray lost, Raonic lost, Kyrgios retired yesterday, Wawrinka lost. What the hell? I guess I really wanna see a potential Federer – Thiem/Zverev Halle Final to ascertain where we stand. If Roger beats either of those two, he’ll feel really good heading into Wimbledon. And Murray losing in the first round. I guess it was smart for Roger to have that extra event last week in order to afford a loss and then get back to his best this week. Would love to see how he’ll do against Mischa Zverev on Thursday. Also – added incentive – a top 4 seeding at Wimbledon which would make things much easier. Very curious because Wawrinka and Murray both lost early after going deep at the French. Thiem won today so we’ll see. Rafa is resting. Djokovic – not expecting him to do anything. Take a look at Fed’s results this year and ask yourself how much can be ascertained? The guy loses to guys he shouldn’t lose to in ridiculous fashion and beats everyone he should lose to in a variety of beautiful ways. He chokes at the 300th ranked donkeys if the ATP and plays 2007-flavor clutch against the guy whose owned him like a cheap suit for his entire career. He stays away for 6 months and wins a slam he hasn’t won in 10 years. Five 3 setters and down a break in the 5th against the Bull. 17th seeed gets him his 18th after a five year drought and we’re looking for a top 4 draw at Wimby. I would say it’s all guess work from here. Clearly nothing can be ascertained except that Fed can’t be predicted. And seriously – if anything I’d take a much higher seeding than 4 please! But even that… who knows?! Loved how he looked in the highlights against Sugita! Just a 66th ranked opponent, but the margins are small and the little guys could hit. A good win to wipe away the mental cobwebs from Stuttgart. He did lose concentration at 5-0, 40-0 in the second, but when you’re a set and triple break up, it’s probably tricky to maintain focus. He was really aggressive (especially on backhand returns) and it paid off. Sugita was surprisingly scrappy given his ranking and if Federer hadn’t forced the issue the match might’ve dragged on significantly longer. Hopefully he can keep going deep into the tournament, and even win it. I think his form will only improve with each match as he gets used to playing on grass again. Backhand looked imperious! Still not used to seeing that power from Fed on that side. Nowhere to run and no weaknesses when Fed’s playing that backhand like that!